Kim Lewis knows tiny homes. 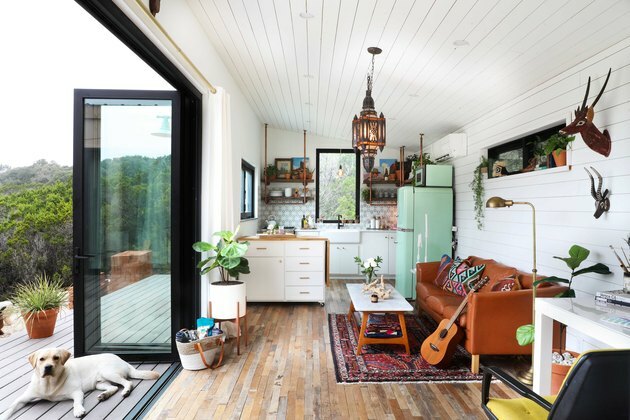 The designer's colorful and compact projects have featured on the show Tiny House Nation, but her most impressive design just might be the pint-size property she shares with her husband, Joey, and 85-pound lab, River. (A baby girl will be joining the family in August.) 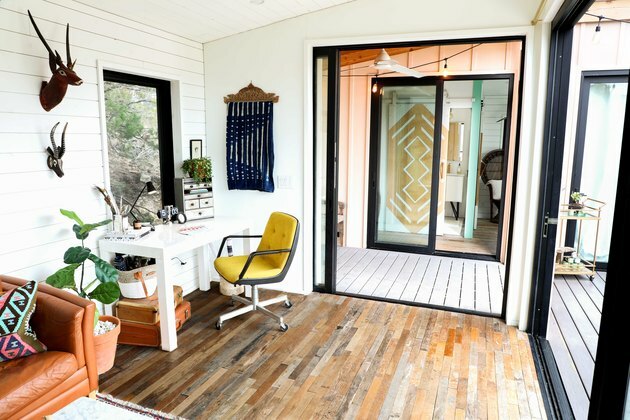 Set atop a hill outside South Austin, Texas, the 560-square-foot home combines two trailers arranged in an L-shape to create separate living and bedroom spaces. Each unit has folding glass doors that open up to the deck, which helps make the home feel larger and more connected to nature. "Natural light was a critical component for the architecture, so the windows and folding doors were a key part of the design," says Lewis. When it came to decorating the home, Lewis took inspiration from her travels, including a trip to Joshua Tree in California. She incorporated burst of color throughout the space, from the rainbow "Candy Land" stairs to the purple stove. The walls were kept neutral to serve as a backdrop for her eclectic collection of accessories from around the world. Lewis was able to showcase her bold style in the small space, proving that not everything has to be big in Texas. 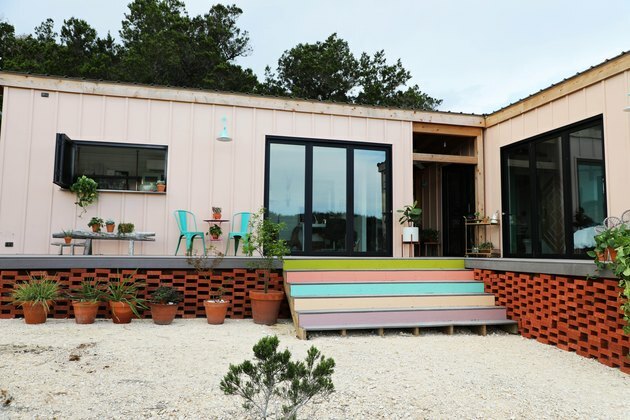 "Finding land to set the tiny home was challenging, and moving it to the location took a small village, and a lot of extra money," says Lewis. "This tiny home is not designed to be hitched to the back of your Ford and go!" She added her signature painted stairs to the exterior. Shiplap siding painted in Sherwin-Williams' Extra White lines the interiors of the home. 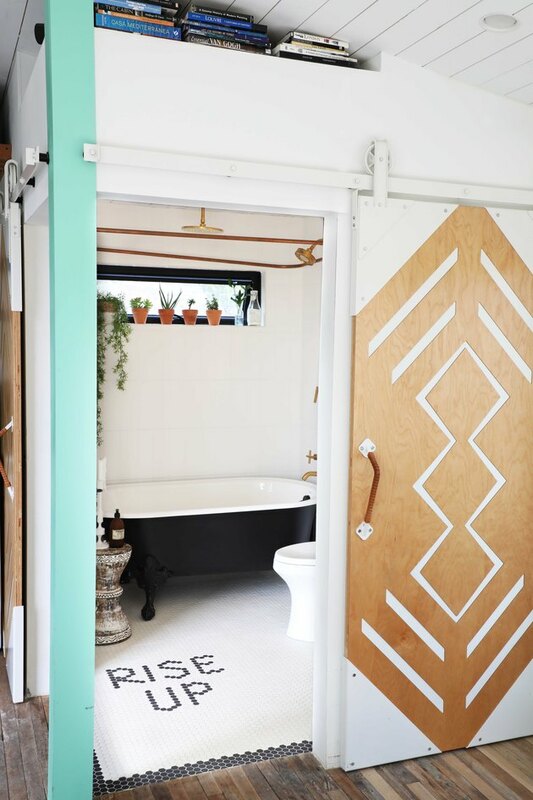 The floors were salvaged from a house in East Austin. Lewis found the pendant light in Bali and the carved antelopes in Ghana. Small appliances, including the purple BlueStar range and mint Big Chill refrigerator, help to maximize the space in the kitchen. 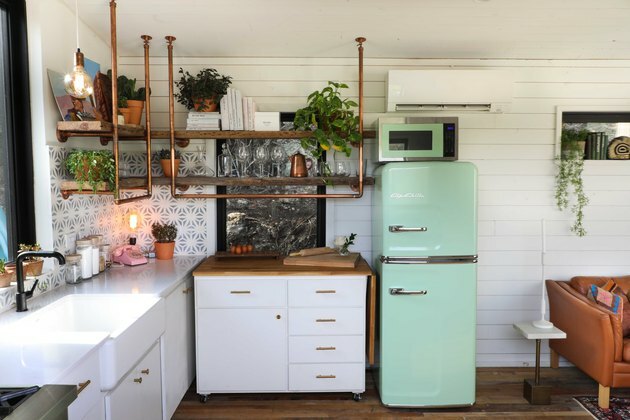 "I've always been inspired by the 1950s and 1970s, so the nostalgic, retro-style fridge was a no-brainer," says Lewis. The La Cantina folding window makes it easy to pass food for outdoor entertaining and has been nicknamed the "drive-through window." 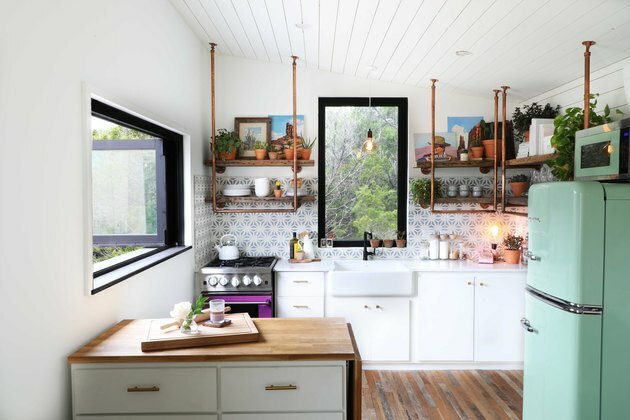 The kitchen's open shelving was created using copper piping and reclaimed ceiling joists from an early 20th-century barn. Lewis used Catalonia Gray cement tile from Clay Imports for the backsplash and installed Silestone countertops and a Kohler farmhouse sink. A 1970s desk chair that belonged to Lewis's grandmother is pulled up to a Parsons-style desk from West Elm in the office area. Lewis's favorite piece in the house is the antique headboard that she picked up in Bali for less than $100. 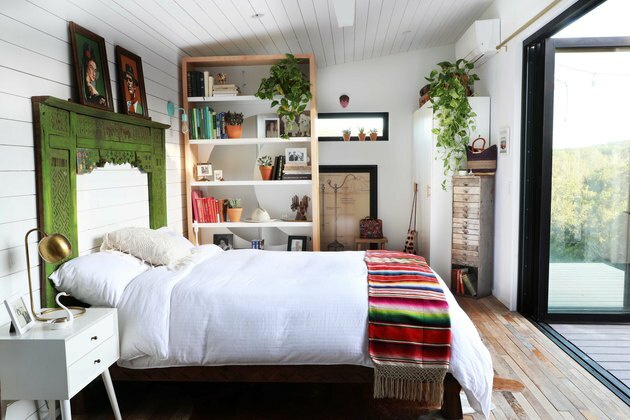 It's paired with a platform bed from Urban Outfitters and a West Elm nightstand. The bookcase was designed by Lewis and built by a carpenter in Austin. 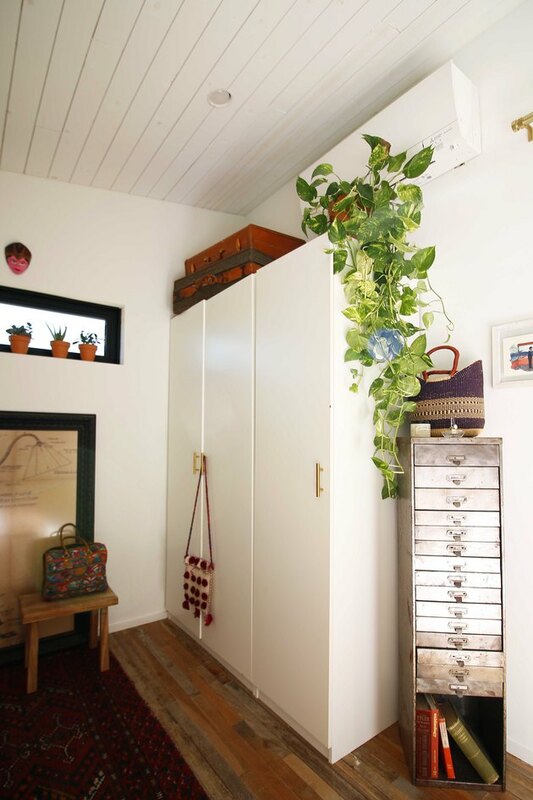 An Ikea wardrobe is topped with pieces from Lewis's collection of vintage suitcases. The designer uses the vintage metal watchmaker's case for jewelry storage. "My dream was to have a clawfoot bathtub, so that was a must!" says Lewis. The Kohler tub sits on a Daltile floor. Lewis designed the barn door for Rustica Hardware.